MortemVetus and IslandGirlDesigns are proud to present Grave Expectations. This massive pack contains everything you need to raise your Michaels and Victorias as undead. With a total of 160 poses comprised of 40 Michael4 poses+mirrors and 40 Victoria4 poses+mirrors theres a stance for every shambling zombie you need. In addition, a number of the poses are designed to work with the interactive Grave Plot, enabling your undeads to break free of their earthly confines in search of fresh meaty living victims. The Grave Plot contains specific morphs for each of the 'rising' poses to really give the impression that these undeads are bursting from their eternal rest. There is also a small selection of headstones for variety. 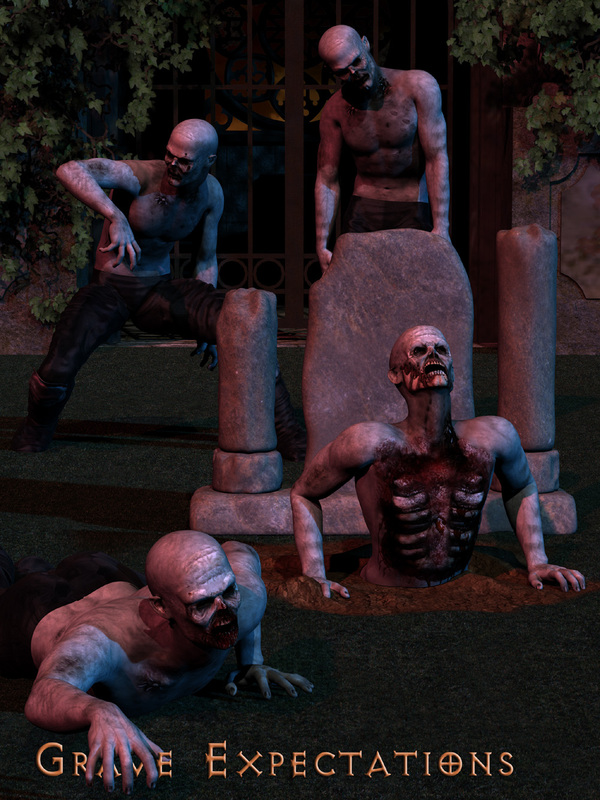 The Grave Plot is constructed in a similar modular fashion to SceneScapes, enabling precise positioning of multiple instances that all fit together seamlessly, enabling the creation of large and unique graveyards, where each grave can have a differing zombie rising from it. Six material options are also included to provide variety between plots. This pack comes with a html User Guide which shows the basic features and use of the Grave Plot and relevant poses.